The Senate yesterday debunked insinuations that it plans to pass a National Grazing ‎Commission Bill into law, explaining that there was no such bill currently before the Red Chamber. The explanation follows public outcry over the purported plan by the 8th Senate to pass the controversial bill. Chairman of the Senate committee on Rules and Business, Senator Babajide Omoworare, who revealed this after Senator Eyinnaya Abaribe raised a point of order, said the contentious bill was presented in the 7th Senate by Senator Zaynab Kure from Niger State. Abaribe, in his remarks, said he had been inundated with phone calls by his constituents. He urged his colleagues to take a firm position and educate Nigerians on the true state of things in order to douse the rising tension. He stated: “I have got more than 1,000 calls over the weekend and this has to do with something that is not before the Senate. It’s something called the Grazing Reserve Commission and everybody is calling me and people are sending me text messages to the extent that when I explained to some of my constituents, who called me, that there is no such thing before the Senate, they now turned around and said ‘the only reason why you are saying that is because you never go to the Senate’. They said I am an absentee member. “And when I asked where is this information coming from, they said the information is coming from the social media. Mr. President, the last time a Grazing Reserve Commission Bill came to this Senate was in the 7th Senate and it was proposed by Senator Kure, who is no longer here. So the reason why I am making this personal explanation is so that my constituents in Abia South know that there is nothing called Grazing Reserve Commission Bill before this Senate. ‎In his additional explanation, Senator Omoworare, explained: “Several distinguished Senators of the Federal Republic of Nigeria have been inundated with the request by members of the public concerning the pendency of a National Grazing Bill in the Senate. “This is to clarify that no such bill has been presented by the executive arm of government and none has so far been filed by any senator of the Federal Republic of Nigeria in the 8th Senate. 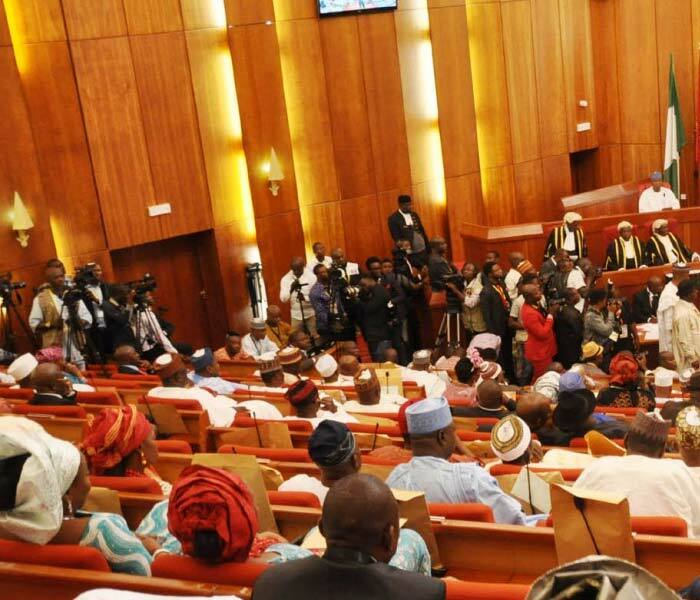 The Senate, yesterday, also dispelled claims that it spent over N4billion in purchasing 108 cars for lawmakers. Instead, it said only 36 Land Cruiser Toyota Jeeps were bought at the cost of N36.5 million each. Chairman of the Senate committee on Services, Senator Ibrahim Gobir, while briefing newsmen, wondered why Nigerians would kick against the purchase of new exotic cars, arguing that, as lawmakers, they were entitled to official cars. Senator Gobir also denied claims that the 109 senators had collected loans to purchase official cars. He said no lawmaker was given any car loan, contrary to media reports. Explaining that the lawmakers were not insensitive to the economic realities, Gobir said they decided to opt for only 36 cars. He said the cars would be distributed to three senators from each of the 36 states. He revealed that the lawmakers will agree on how the vehicles will be utilized. Gobir explained: “The issue that we got 108 cars is not correct. We only got 36 cars. Each Senator in every state is either a chairman or a vice. We gave a car to three senators from each state to share among themselves. We did not buy 108 cars. We cannot afford it. The cost of the car is N36.5 million. They are V8 cars and not V6 as reported. “This particular car sells for about $90,000. That is about N28 million. By the time you add one percent, it will amount to about N36 million per car. We are supposed to buy 109 cars, but because we are concerned about the situation of things, we decided to buy only 36. Since the news broke that senators procured 108 exotic new cars, it has generated mixed reactions. While some have argued that they were statutorily entitled to official cars, others, especially civil rights groups and labour unions maintained that the purchase was ill-timed. They had subsequently asked the lawmakers to return the cars or face a mass protest. The car controversy is coming barely one month after a similar outcry followed the purchase of new exotic cars for the Senate president, valued at over N300 million.